Every new artist coming in is always going to be compared to someone. I don't mind doubts, they motivate me. In my downtime I like to just go surfing and hang out with family and friends. I actually grew up listening to country music. I like a girl that's just fun to be around. They make me laugh, but also they're faithful and honest. And it's all in the eyes. Artists that inspire me now are Justin Timberlake, and also Jason Derulo. If its your dream, then it'll come. But have fun with it as well. I definitely am from Australia...you can tell by my accent! If I'm not singing for a few days, I go straight for a vanilla milkshake! I mostly write songs about my personal experiences with girls. New Updates! (4/26/2019) We've been working really hard on completing our membership system so you can submit quotes and keep track of them. Once this is complete in the coming weeks there will be a lot more quotes by Cody Simpson and other authors. 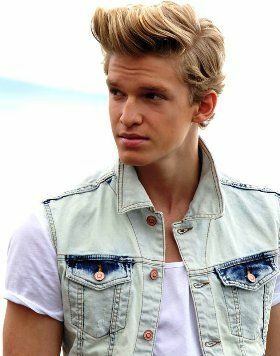 We've also changed the sorting on the site so you now see the latest Cody Simpson quotes first. Our goal is to have the best Cody Simpson quotes on the web!